Every Wednesday Michio Kaku will be answering reader questions about physics and futuristic science on his blog at Big Think. If you have a question for Dr. Kaku, just post it in the comment section on his blog; Dr. Kaku’s Universe and check back on Wednesdays to see if he answers it. Today, Dr. Kaku addresses a question posed by Andy Speight: Are the supermassive black holes at the center of galaxies involved in the formation of those galaxies? Dr. Kaku’s recent video interview at the Big Think studio has finally been published and split into three parts: Inventions of the Future, Will Mankind Destroy Itself and How to Stop Robots from Killing Us. 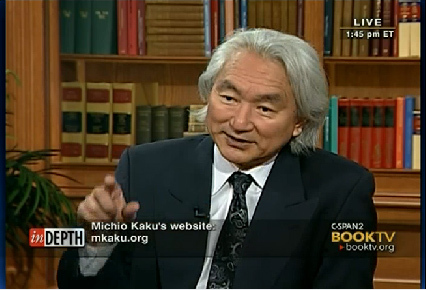 Take a look at the last ten blog entries on Dr. Kaku’s BigThink.com blog; Dr. Kaku’s Universe. Don’t forget to register on the Big Think website so you can make comments on the blog entries where Dr. Kaku will be answering questions. Alien Invasions — Should We Be Worried? Is Our Moon Really Shrinking? Michio sits down with Peter Slen of Book TV (C-Span2) for a 3 hour In-Depth interview talking about his life, career, and his work. Dr. Kaku also responded to telephones calls and electronic communications. Please visit http://www.c-spanvideo.org/program/id/234213 to watch the entire interview.